As an artist the most frequently asked question people ask me is "What's the story of this piece?" I actually love this question! I love it because I do have a story involved in every piece of art I create. My hope is that the viewer has also imagined a story for themselves and either wants confirmation or to hear MY version. It gives me the chance to describe what I was thinking about during the creative process. I grew up with a wonderful variety of visual storytellers. Some of my personal favorites come from Film. People like Ray Harryhausen, Alfred Hitchcock, The great Universal movie monster movie classics and of course anything with Godzilla in it.. I loved the worlds these films/film makers brought to life. Worlds where we are not alone. Worlds of myth and science. Worlds of pasts and futures colliding. Much of my recent work has been about a science fiction story I am working on. This story is about a newly discovered technology/element that has the potential to change the course of history. 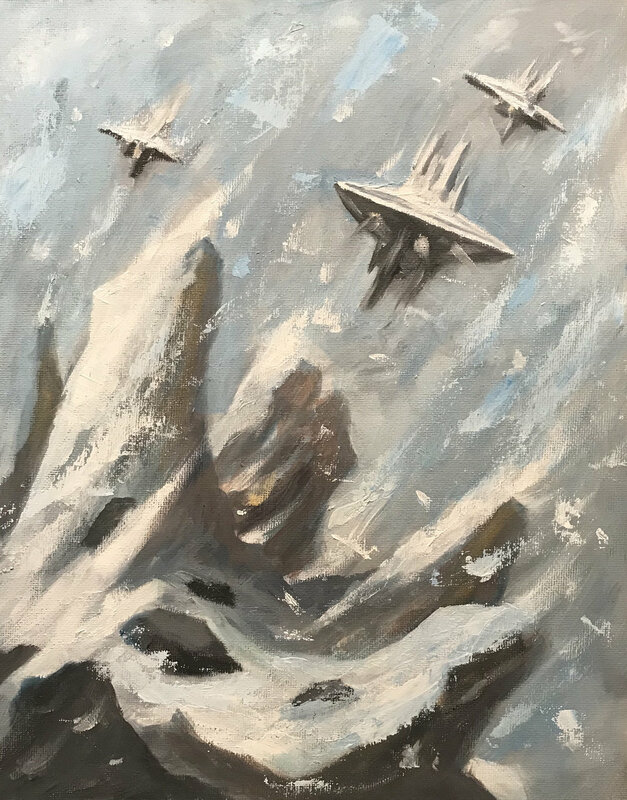 I don't want to give too much away just yet but the main "characters" include a fleet of unmanned drones, a group of highly trained special operatives and the "Icarus Stones" as I call them. I am very excited to tell this story. In the months ahead I will be sharing it's development here as well as other works and news. I hope you will enjoy watching things progress and that the world I am building here will be of interest to you. I am no good at stop motion animation but I have grand plans to make this as interesting a visual narrative as I possibly can. If you like the classic science fiction and fantasy films of the past I hope you will enjoy this little ride as well. My studio door is always open!